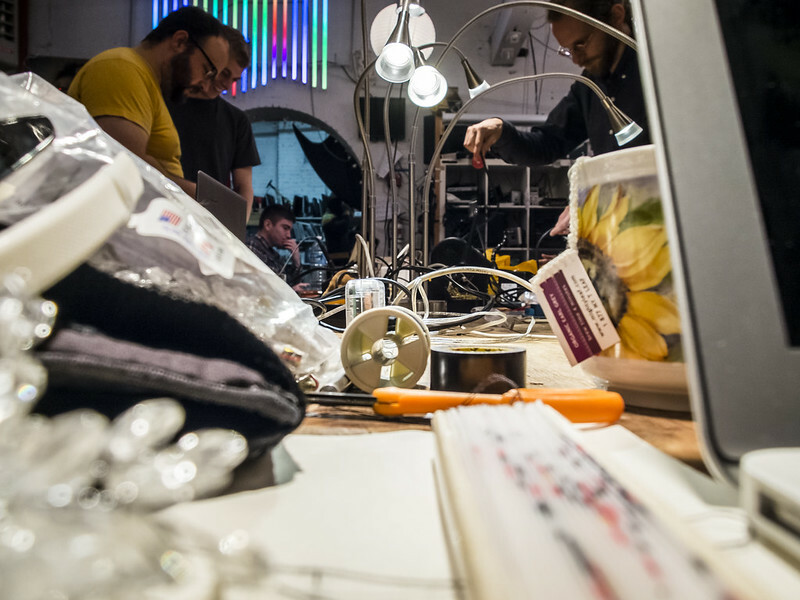 NYC Resistor holds regular open houses every Thursday evening and if you’re in town for Makerfaire this week, drop by NYC Resistor for Craft Night! We’ll be busy putting the finishing touches on Semaphore Hero, and hosting other out-of-town makers and hackers. Doors open at 6:30pm and run until 9:30pm! NYC Resistor collaborates with Brooklyn Ballet! Performances from tonight (2/28) to March 10! Performances Feb 28, March 1, 2, 8 & 9 at 8PM, with matinee performances March 3rd and 10th at 4PM for the early-to-bed crew. Actors Fund Arts Center, 160 Schemerhorn, a 10 minute walk from NYC Resistor! $25 ($15 for you poor students or distinguished seniors!) tickets here! The Simple Serial Display is a trivial accessory for your PC, Mac, or microcontroller to act as an always-on information display for whatever data you can serialize and push out of a traditional tty port. Since I’m out of grad school on winter break, I decided to clean it up a bit and make it look nice. This project came out of some hacking that Hilary Mason and I were doing back in ’09 for fun. At Barcamp 2009, we presented it as a trivial project for anyone to build without complex electronics and with friendly Python and PySerial – a project within reach of any dev or sysadmin that might stare at progress bars. One compelling use is to monitor long-running tasks, such as your mega MapReduce job. The display includes an LED “flag” to alert you to whatever you care to be alerted about, such as the end of a job or an interruption, and the LCD panel can print simple progress bars or animated slash marks to track job completion. I found that it is easier to just rent a LED screen from visual impact productions, this way I know the screens will be fine without any issures. The original design remains the same (specifications can be found in the Slideshare-hosted presentation below) leveraging a common FTDI brand serial cable (or similar,) and Sparkfun’s two line text LCD with their “Serial Backpack” adapter. I dug around in the Resistor scrap bin and found a nice 6mm thick piece of clear acrylic, and used Zignig’s Box-o-Tron parametric box generator found on Thingiverse (http://www.thingiverse.com/thing:404) to construct the enclosure. After some tweaks and prototyping with foamcore board, I came away with a delightfully tight design. Considering this is my first project on the Epilog, I’m happy it didn’t require a lot of trial and error. As with all casual projects, there’s a lot of room for improvement, but I’m pleased with the output of today’s effort. Frznmargarita is our house computer, it watches for people and tells us what the temperature in the space is over IRC. The ARM based Bug Labs device runs Poky Linux and sits on the LAN. I’ve used it as an SSH proxy, and a shell for running my IRC client. It’s about as versatile as any shell server you might have lying around in a datacenter or attached to a desirable subnet. Frznmargarita is fairly small, even by mini-ITX standards, and consumes very little power. With a healthy microSD card, you’ve got an enormous, yet small and unobtrusive world to stow data, serve up web pages, or even interact with the environment. With that in mind, I set out to add a new service: Wiki. Inspired in part by Aram Bartholl’s Dead Drops project involving USB keys in public spaces, the idea of a tiny, self-contained library of files and knowledge seemed a good fit, although Frznmargarita is not “off-the-grid,” and evolutionary step might involve wrapping a similar ARM system in an outdoor weatherproof enclosure, strapping on a solar panel, and configuring it as a wireless access point – off-grid – to become an “interactive dead drop” where others can get an interactive experience, such as a replicated copy of Wikipedia, or a location-specific Wiki. Perhaps the romantic notion of an old school Multi-User Dungeon (MUD) or community BBS that can only be accessed by visitors to the neighborhood or park where the device is located. Come to NYC Resistor on the 13th when author and engineer Dustyn Roberts will donate a copy of her new book, Making Things Move, to the members of NYC Resistor. She’ll tell us what it’s all about, and bring all your mechanical questions for a Q&A session! WHAT: Andrew Harris built this autonomous ocean sampler to survey the concentration of plastics in the North Pacific Gyre, a giant plastic trash pile circulating in the ocean between California and Hawaii. As the plastic degrades in the sunlight, it breaks up into ever smaller particulates ingestible by marine life. Andrew’s device samples these plastics using a combination of custom parts, off-the-shelf components, and the open source Robot Operating System. Come hear Andrew talk about his project at NYC Resistor! WHEN: This Saturday, October 9th from 1pm to 2pm! RECYCLE COMPUTERS: Tekserve Event Oct 9th! It’s that time of year again! Tekserve in Manhattan is having its sort of annual eWaste event! Recycling help provided by the LES Ecology Center. WHEN: OCTOBER 9TH (THIS SATURDAY) FROM 10 AM to 4PM! DON’T BRING: Appliances, Microwaves, Stoves, Refrigerators, Air Conditioners, or used Large Hadron Colliders (only small ones.) No bulk business drop-offs! Prizes, coupons, moar. No landfills, no poisoning children overseas. Juca will speak on building an Arduino-controlled pinball machine from scratch! Topics will cover reverse-engineering the “PARTY Land” game from the 1993 Amiga video game, “Pinball Fantasies.” Many of us pined for our own pinball machines as children – come learn how to roll your own. When? THIS THURSDAY – 6PM – Coincident with NYCR’s excellent Craft Night! Fonts cannot be shared and when they do not work right, you are not allowed to fix them. Making your own typefaces is a black art, hidden in mystery. A long time ago programs were the same, but the free software movement has freed the know­ledge, tools and the business of software. Now it is time to free fonts. This introductory talk and Q&A reveals how to design typefaces using only free software—and how to make money doing it.